Is your business looking for its next copier that has an outstanding print speed? The Xerox Work-centre 3655i Mono Copier is an incredible piece of kit. 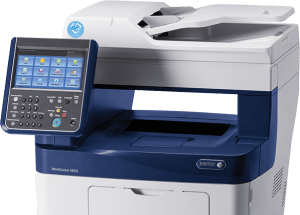 With an unbelievable print speed of up to 47 pages per minute you will no longer be standing around waiting for your documents. And don’t worry, the print quality is up to 1200 x 1200 dpi so your documents will print fast but still be sharp and crisp! The Xerox 3655i copier allows your staff to control device functions from any workstation, laptop or MAC. The Remote Control Panel makes it super easy to train users and for IT staff to remotely view and monitor the user settings. This means if there’s an issue with the device your IT can remotely check and resolve without having to walk up to the copier each and every time! With the Xerox 3655i mono copier you’ll impact your bottom line and impress your customers.